A soldier, who allegedly punched the left eye of a police officer, Chief Inspector Samuel Donyoh, has been hauled before an Accra Central District Court for assault. S/Sgt. 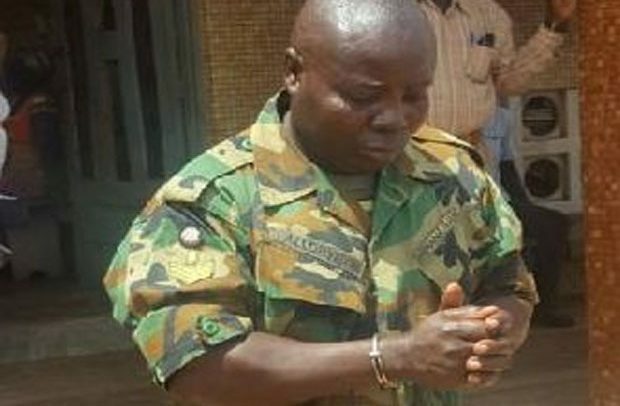 Seth Alloryitih, who is attached to the 492 Squadron at Tema in the Greater Accra Region, is alleged to have been acting as a land guard to a group of people who were winning sand at the Apolonia City area in Accra. Following a tipoff, the police officer and his patrol team went to the site and were confronted by the military officer who purportedly attempted to take snapshots of the police officers. He is said to have been infuriated by the officers’ refusal to be captured and out of anger, landed the blow on the Chief Inspector’s eye. He is before the court charged with one count of assault on public officer. S/Sgt. Seth Alloryitih pleaded not guilty and was granted bail in the sum of GH¢7,000.00 with two sureties who must all be gainfully employed. The case has been adjourned to May 24, 2018. The facts of the case, as presented by Detective Chief Inspector Simon Aporsornu are that, the complainant is a police officer stationed at the National Highway Patrol Unit in Accra. He recounted that between January and April this year, the Police Service had recorded a series of attacks on its personnel by the military and the Chief of Defence Staff had to issue some guidelines to curb the clashes between the two security agents. He said on May 9, 2018, Chief Inspector Samuel Donyoh was leading a seven-member patrol team along the Apolonia City stretch. According to the prosecutor, at about 4:30 pm, the police officer and his team received information that a group of people were winning sand at the Apolonia City area and so the law enforcers proceeded to the site. Detective Chief Inspector Apiorsornu told the court that upon reaching the site, the patrol team saw the military officer who was fully dressed in his uniform acting as a land guard to the sand winners. “He then demanded to know what the officer and his men were doing at the site. In the process, the accused attempted to use his mobile phone to snap pictures of the complainant but the complainant declined to be captured. This infuriated the accused person and he gave a hefty blow to the complainant on his left eye and blood started oozing profusely,” the prosecutor said. He added that after the assault, S/Sgt. Seth Alloryitih took to his heels but was chased by the patrol team and eventually arrested. He said the accused person admitted the offence in his caution statement.